If you do not wish to vote at this time, click here to visit PrisonSteam - Free Browser Based Prison-Style MMORPG stats. 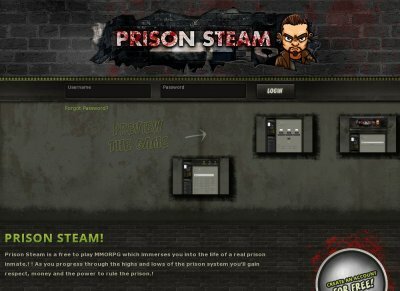 Prison Steam is a free to play MMORPG which immerses you into the life of a real prison inmate.! ! As you progress through the highs and lows of the prison system you’ll gain respect, money and the power to rule the prison.! • Fight your way to the top in thrilling PvP battles! • Gamble and mug your way to extreme wealth! • Lead a gang into power and become feared by all! ! Think you’re up for the challenge?